Other Products: Thick White Cardstock. Glass mini beads. Ribbon. Instructions: Click here to view a larger photo of this project. 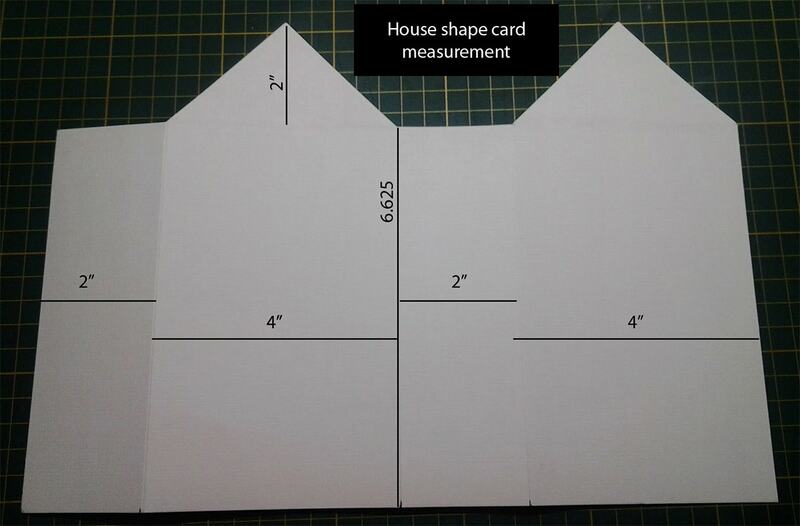 Card stock size for house shape card width is 12" and score at 2", 4", 2", 4", height is 6 5/8", 2". For top house cover roof size width is 7 7/8" and score at center, height 3 1/8". See template here. Cover the base with Backyard Blossoms Pattern paper as seen on the picture. For the front cover cut two medallion die and paste it at the centre and on top of that adhere one circle die with foam tape to give some dimension. Next stamp some Backyard Blossoms and Garden Edge Coneflower with archival ink plum, leaf green, orange blossoms and die cut them with matching die color them too with archival ink and then shape them with deluxe flower shaping tool kit and then sprinkle some glass mini beads. Now arrange these embellishments as shown. Now stamp Blossoming Coneflower and Garden Edge Coneflower and Backyard Blossoms with plum archival ink and cut them with matching die. For one set of Blossoming Coneflower, color them with archival ink-Leaf green and for second stamp and die cut color it with archival ink- Sunflower and Cactus Flower and shape them with Deluxe flower tool kit and sprinkle crystal clear glitter and at the centre of the coneflower sprinkle some prills and Redland elements, and layer it on the first set. Next for the Garden Edge Coneflower and Backyard Blossoms stamp with archival ink plum and die cut them with matching die color them with archival ink leaf green, sunflower and cactus flower and shape them too and then at the centre of the flower sprinkle prills and Redland elements and sprinkle crystal clear glitter on the flower petals. Now adhere these flowers on the right side of the card as shown. Now for the Top of the house roof, cover it with pattern paper. For the edge cut two border die from Sweetheart border set and paste it on the edge as shown. Then add some crystal clear glitter on it. Next paste a border of pattern paper from the collection and adhere it as shown. 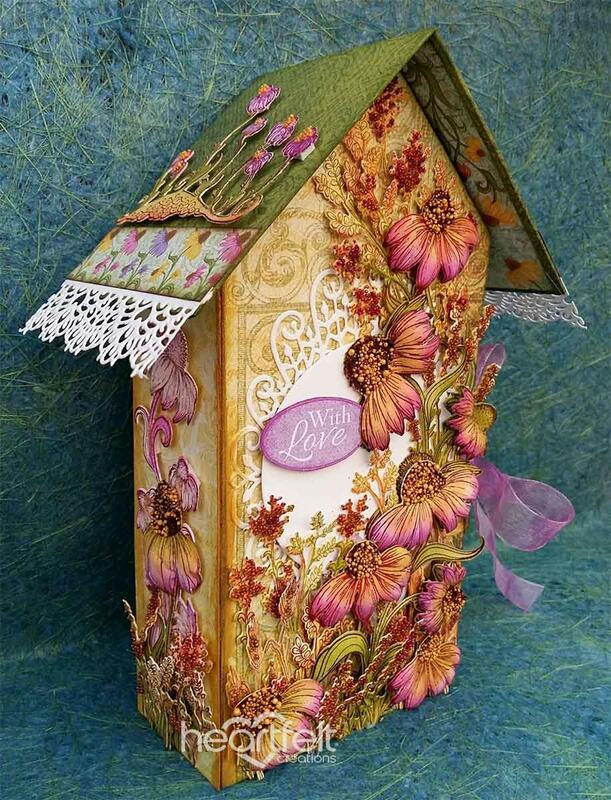 Now stamp Backyard Blossoms with archival ink plum and die cut it with matching die and color them with leaf green, sunflower, carnation red and cactus flower and at the centre of the coneflower add yellow prills. For the spine of the card, stamp one Blossoming Coneflower border with archival ink plum and cut it with matching die and color them randomly with archival ink cactus flower and then add crystal clear glitter and adhere it with foam tape. Now add one flower from Backyard Blossom and some leafs, bushes. Now close the card with ribbon.